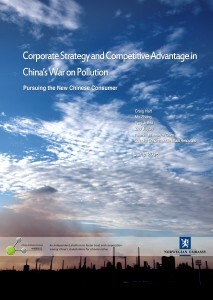 On June 11, China Carbon Forum launched a new report, Corporate Strategy and Competitive Advantage in China’s War on Pollution – Pursuing the New Chinese Consumer. The report is available in English and Chinese. The report was authored by Professor Craig Hart, Dean Ma Zhong, and researchers Ying Jiahui and Zhu Jiayan of Renmin University of China’s School of Environment & Natural Resources, and facilitated and published by the China Carbon Forum. The Royal Norwegian Embassy, Beijing provided financial support for this project. The report’s conclusions inform business strategy for firms seeking to tap into China’s emerging market in green products and services.